Hey Love: Finds Under $50! Travel Totes! Finds Under $50! Travel Totes! Hey loves! Welcome to this week's Finds Under! This week I'm featuring the Tote Bag! It's Summer and that means travel, pool days, beach days, and I need to carry around tons of stuff days! From the pool to the gym a tote bag is the perfect accessory for your look. There are tons of great options and sizes! Check out my finds below! And they're all under $50! 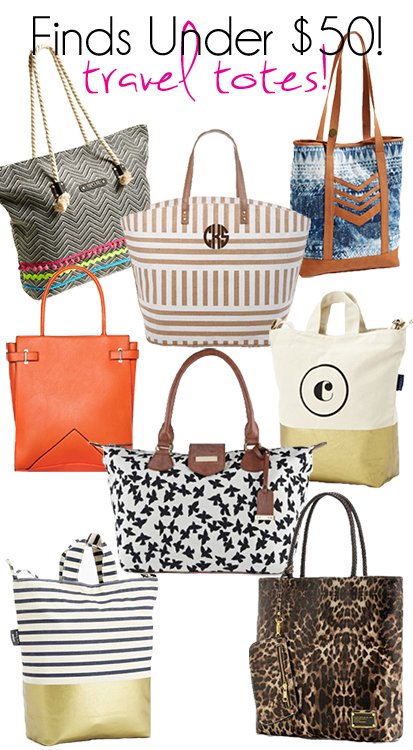 I'm obsessed with the Gold Dipped Tote and the Striped Monogram! Which is your fave? Loving the striped monogram ...And the birds! Great picks! Love that first bag! All of those bags are great! Lovely picks! These are all so cute, but yeah, we are loving the gold dipped bags so much! Oeh die tijgerprint is tof! Ik maak zelf ook toto bags maar dan de dip dye variant. These are such fabulous finds! Love the gold diaper bag!! such chic bags, thanks for sharing! Love these picks! Especially the top middle one! Now I can't decide I love all of these! Omg so cute!! Love all of these, especially that gold dipped one and the bird one! Too cute! I would love one of each please!